Should I Use My Security Alarm While Selling My House? Question: Should I Use My Security Alarm While Selling My House? A reader asks: "I accepted a job offer that necessitated relocating and buying in another town. So, I just put my house on the market. Because it's vacant, I prefer to turn on my security alarm. My agent says to keep it off. I want other agents to call her to get the alarm code, but she's against the idea. What do you think? Should I use my security alarm while my house is for sale?" Answer: When you're selling a home, especially if you're not living there, you may feel strongly about securing your home for a home sale. 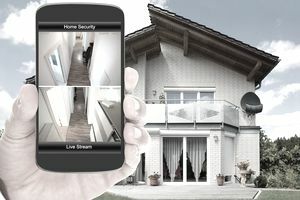 Before you do, though, ask which is likely to be a bigger hassle: Burglars or the burglar alarm? The alarm provides some protection while the house is vacant. It also provides hours of amusement or aggravation when people are at the house, such as buyer's agents who can't make the alarm work, can't find it, can't read directions or generally don't deal well with stress. As a real estate agent, I usually find out about the latter situation when my cell rings. "Uh, hi, are you the agent on such-and-such?" is usually how these conversations start. The giveaway isn't what they say, but the nervous way they say it. Oh, and the constant BEEP! BEEP! BEEP! that's blaring away in the background. "Didn't you see the note on the listing that said to call me for the alarm code before you brought clients over?" I generally ask. This usually results in a moment of silence (aside from the alarm sounds) before the agent says: "Uh ... no." Often they've been out driving around and a client spotted the for sale sign, and the excitement of hopping out and looking at a possible new home trumps such petty concerns. As a result, I now often stick a sign rider on my vacant listing sign posts that reads: By Appointment Only, hoping to generate the impression that the home is occupied. But sometimes agents don't pay attention to that either. So, should you set an alarm when you're selling your house? If you think it will be particularly obvious the house is vacant, then an alarm might be prudent, especially if the area has had problems with break-ins or squatters. If you're the nervous type who won't sleep for worrying about security, an alarm might help you get some rest. But what if you're thinking of setting the alarm only out of an abundance of caution? Murphy's Law; namely, if something can go wrong, it will. Eventually, some agent is going to set off the alarm and won't have the code. Is that a big deal? It depends. It may just mean an annoyance to the agent selling the property. On the other hand, if your alarm company or the city charges you for too many false alarms, it could be expensive. Your secret alarm code isn't nearly as secret anymore. If you include the code in your MLS listing, anyone who can read the confidential agent comments can learn it and visit the home (including maybe a real estate agent's sister's sleazy new boyfriend; hey, stuff happens in the real world). If you tuck a copy of the code in the lockbox, an agent yakking on the phone while he puts the key back after a showing might not notice that it fell out for the neighborhood kids or the mailman to find. Your secret password isn't a secret either. Why? Well, if one of those random knuckleheads sets off the alarm, the alarm company is going to call the house. Whoever is there is going to have to know the password or else guards will be on their way. And who will the knuckleheads call? Your agent. Better hope she knows the password and she's by her phone. If you decide not to make any of those secret codes public, you could always just insist that your agent be there for every showing. That's secure. It's also a good way to exclude potential buyers. If a buyer's agent is forced to make an appointment and arrange a tour around that appointment, they might skip your house. Some of them will do it, but some will look for other homes that aren't so much of a hassle. The bottom line? Determine the risk of having fewer potential buyers versus peace of mind before you decide whether a security alarm is your friend or foe.